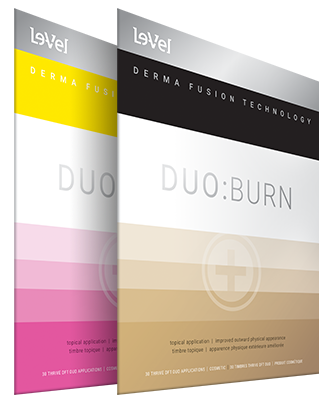 Catapulting off the advancements made during the development of DFT DUO, BURN utilizes a special concentration of Forslean 95% extract, which is one of the most clinically-studied ingredients globally. BURN’s proprietary formula also utilizes an additional 67% of the amount of bulk ingredients compared to DUO's formula. This huge jump is by far the largest amount of premium grade bulk ingredients with which we’ve ever coated any DFT application. Also note that BURN’s high grade adhesive has been uniquely engineered specifically for BURN and is different than the adhesives on the other DFT products. The adhesive's role is to help dilate the pores of the skin to allow for the bulk load of ingredients in BURNto properly, and more effectively, transfer to the DERMA (skin). For best results, use THRIVE BURN with THRIVE Lifestyle Capsules and THRIVE Lifestyle Shake. Proper sleep and weekly exercise are also recommended to achieve maximum results from your BURN application. Welcome to the next level of premium products—welcome to THRIVE BURN.